Mr. Brady received a Juris Doctor degree from Boston University School of Law in 1975 after obtaining a Bachelor of Arts degree from Columbia College in 1972. Mr. Brady began his legal career as a prosecutor in the Kings County District Attorney’s Office where he served as the Deputy Bureau Chief of the Criminal Court Bureau and Trial Supervisor of the Rackets Bureau. He was responsible for the investigation and trial of cases involving organized crime and official corruption, as well as the training and supervision of over 50 assistant district attorneys. After completing his public service and before founding Koster, Brady & Nagler, LLP, Mr. Brady was a partner and lead trial attorney at another major New York City defense firm. He is widely recognized as one of the premier civil liability defense lawyers in the New York Metropolitan area and has tried over 75 cases to verdict. Mr. Brady is a charter member of the New York State Medical Defense Bar Association, a member of the American Bar Association (Litigation and Tort and Insurance Law Sections), the Association of Trial Lawyers of America, the New York State Trial Lawyers Association, the New York State Bar Association, the New York County Lawyers Association and the Bergen County Bar Association. Mr. Brady has taught and lectured extensively on the topic of trial techniques and the defense of civil liability cases for the Trial Lawyers Section of the New York State Bar Association, the New York State Trial Lawyers Institute, New York Law Journal Seminars, Suffolk County Bar Association and a number of medical and professional associations. His publications include “The Use of Demonstrative Evidence in New York” (NYS Bar Association, Trial Lawyers Section), “The Art and Craft of the Defense Summation” (Chapter, Medical Malpractice in New York, 3rd Ed., 2009, New York State Bar Association), “Presentation and Cross Examination of Experts in the Computer Age” (New York State Trial Lawyers Institute), “Preparing for Trial from the Defense Perspective” (New York State Trial Lawyers Institute), “Cross Examination of Plaintiff’s Expert in Obstetrical Cases” (New York Law Journal Seminar Series, and “The Thorny Path Through Undue Familiarity Claims” (Professional Liability Underwriting Society Journal). Mr. Brady has also occasionally served as a legal commentator on Court TV. Between 1994 and 2001, he served annually as a judge for the Northeast Regional Finals of the National Appellate Advocacy Competition conducted by the American Bar Association. 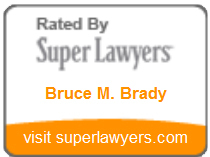 Mr. Brady has been recognized as a “Super Lawyer” in the Thompson Reuters New York Metro Survey every year since 2006, a “Top Attorney in New York” in the New York Times lawyers survey since 2011 and maintains a Preeminent AV Rating in the Martindale-Hubbell Peer Review Ratings. Mr. Brady is admitted to practice before the Courts of the State of New York, the State of New Jersey, the Commonwealth of Massachusetts, the United States District Courts for the Southern and Eastern Districts of New York, United States Court of Appeals, Second Circuit, and the Supreme Court of the United States. Since 1992, Mr. Brady has served in a variety of capacities (Chairman, Board Member, Executive Committee Member, and Continuing Quality Improvement Committee Member) for Children’s Aid and Family Services, Inc., a non-profit agency which provides residential and therapeutic services to abused and neglected children and troubled families in northern New Jersey. In that capacity, he regularly advises the agency on governance, regulatory, risk management and confidentiality matters.